The Samsung Gear S2 is slowly building up more hype ever since it was officially teased at the company's Unpacked event with the reel uploaded to YouTube. 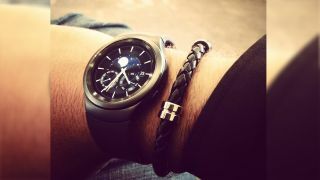 Taking to social media, VP for Samsung design Dennis Miloseski decided to post a photo on Instagram of the new Gear smartwatch with the hashtag filled caption: "Giving the new Samsung Gear S2 a test drive. #samsung #watch #wearable #nextlevel." We've noted it looks similar in design to the Moto 360 and LG Watch Urbane but from this latest photo, the new Gear looks almost slimmer, seemingly laying flatter on the wrist. This strap appears to be some sort rubber (or leather) that sits well up against the shiny lugs of the watch. Two buttons are also visible in the photo. So far other smartwatches have been designed with one button, no buttons, front buttons or a crown like the Apple Watch. More details on the wearable will be revealed during IFA 2015 but until then, we can probably expect more leaks and photos.